Latest series of Casio G-Shock Wrist Watch is dubbed GXW-56 Series. This GXW-56 Series consists of 3 different models of GXW-56-1AJF (Black/Red), GXW-56-1BJF(Black/Gold) and GXW-56-4JF(Orange/Black). 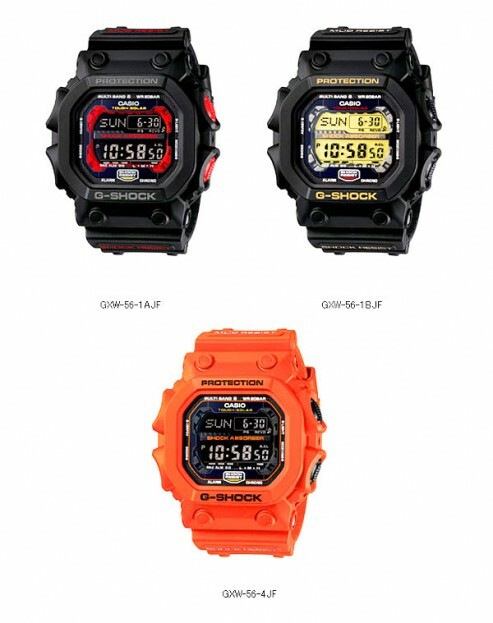 All Casio G-Shock GXW-56 Series’ wrist watch has a newly developed stronger impact-proof body than the previous models. The Casio GXW-56 Series also come with all basic G-Shocks features, you will also find widgets such as Tough Solar and Multiband. Casio G-Shock GXW-56 Series’ wrist watch will release in Japan by late July this year. The shock-resistant design and extended battery life of the Casio Men’s G-Shock Classic 10-Year Battery Watch make it a one-of-a-kind timepiece. This strong watch is constructed with a durable black resin case, a stationary black resin bezel, and a black resin wristband with an adjustable buckle clasp for a personalized fit.